Learning to ski off piste is getting so much easier. With the latest modern off piste skis these days, it can be much quicker to learn to ski off piste than in the past using more conventional skis. The invention of fat skis that are much wider under the foot is speeding up the learning curve for wanna-be off piste skiers. The new skis give much more stability in deeper snow conditions and allow for better control as they simply float more, thus making things alot easier to learn to ski off piste. Also in more recent years, ski manufacturer's are making skis with a "rocker shape". This again makes learning to ski off piste much easier than before as the skis really have been made for the job. The tips and tails of the skis are made to be higher than the center of the ski giving them the "rocker shape". This makes pivoting the skis in deeper snow much easier than a ski with a conventional camber, as the tips and tails of the skis do not catch in the snow so much. Rocker shaped skis also help for balance allowing the skier to stand up and forwards over the skis. On rockers, you are far less likley to be forward face planting! The tips of the skis do not want to dive downwards into the deep snow as they are bent upwards, creating a far easier feeling when skiing knee-to-waist deep snow. Technique on the new skis has changed a lot also. In deep powder snow using conventional skis with a normal camber, the skier would have to push on the skis so as to bend them into adverse camber. The rocker skis are already bent into adverse camber, this means far less physical energy wasted poping up and down as we used to on skinny skis. The fat rockers allow us to concentrate on the smoothness of those curves. This also allows us to use more leg steering with a little less edge tilt to help slash off speed when needed. 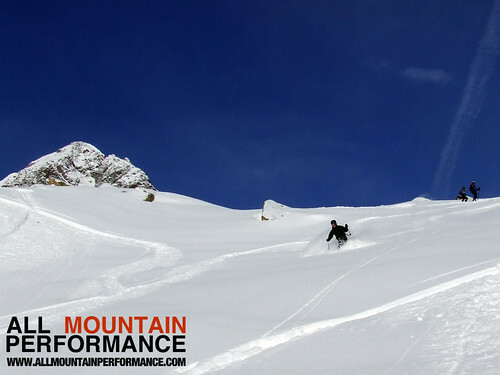 By head coach Mark Gear from All Mountain Performance in Chamonix.